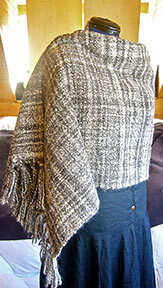 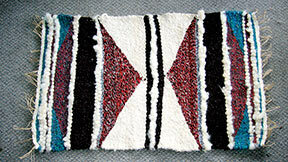 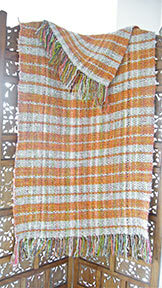 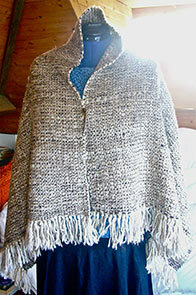 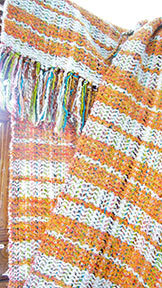 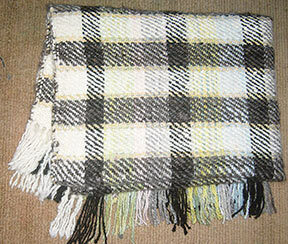 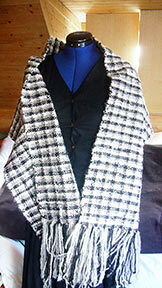 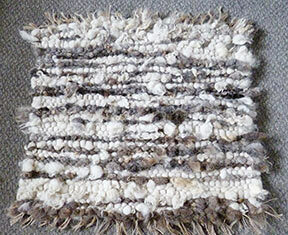 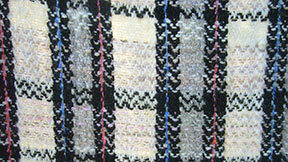 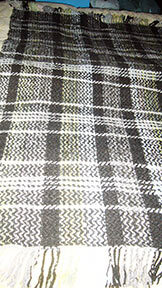 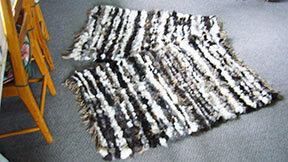 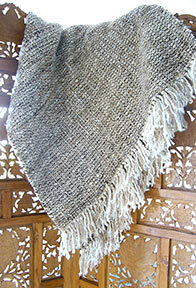 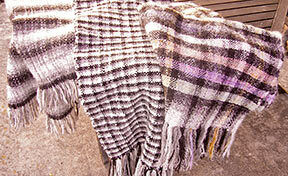 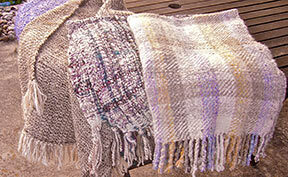 The woven pieces shown here are examples of the styles and items that I make. 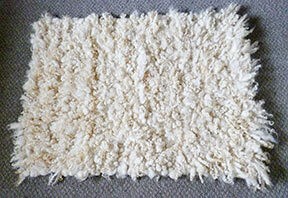 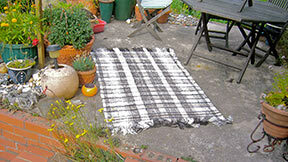 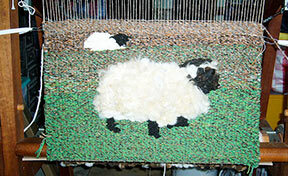 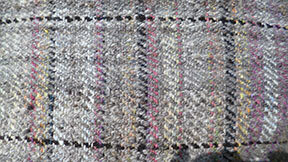 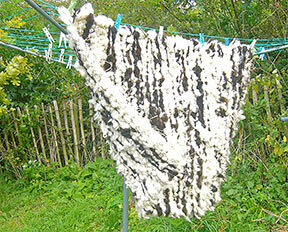 Where possible I try to use local fleece from rare breed flocks. 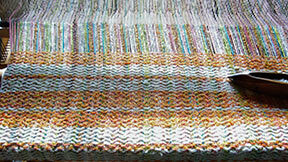 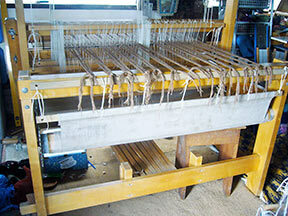 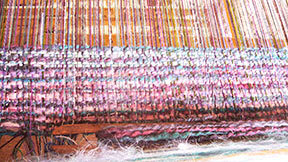 I have three looms, a Harris upright rug loom, a Varpapuu Finlandia countermarche loom and a Macomber Jack loom. 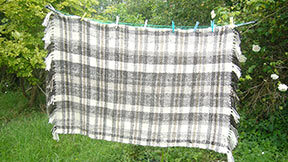 The Varpa is pictured left. 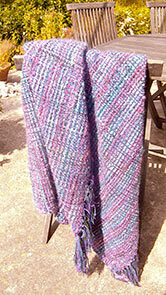 Here are some of my wraps, these are all from handspun wool in their natural colours or dyed by myself. 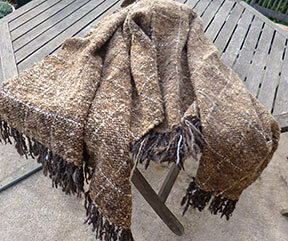 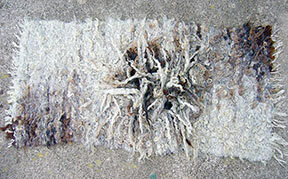 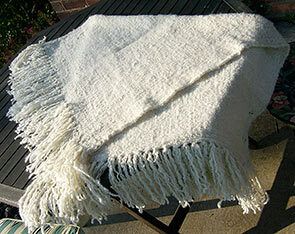 I use natural plant material for this or commercial acid dye. 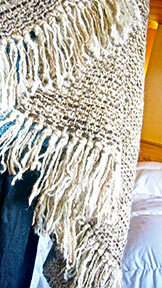 They make excellent pram blankets, bed runners, knee wraps or just shoulder snuggles. 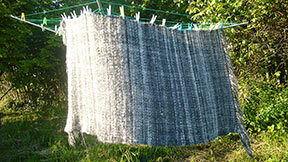 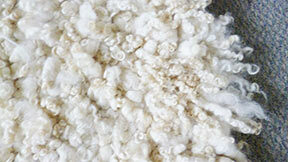 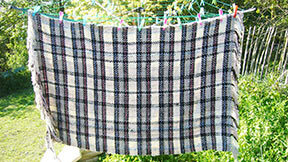 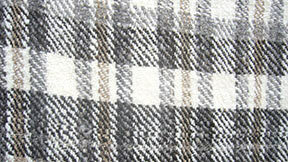 Soft yet hard wearing, they can be gentle hand washed, short spin or line dry. 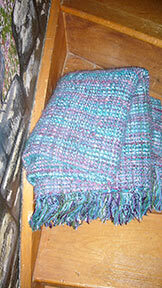 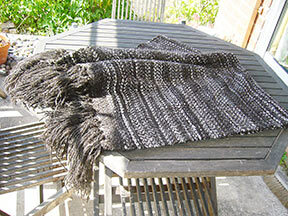 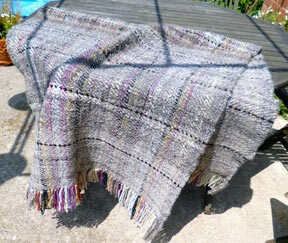 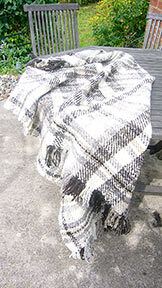 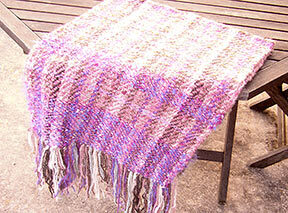 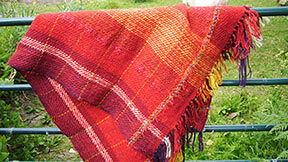 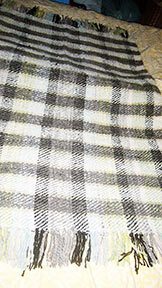 Next up are these slightly larger wraps and Heirloom blankets/wraps. 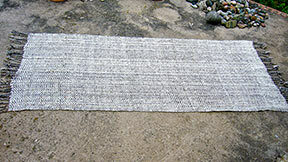 Up to 42 inches wide. 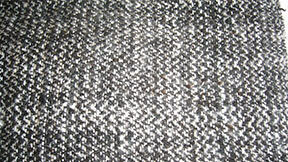 The one pictured far left is from a whole Jacob fleece. 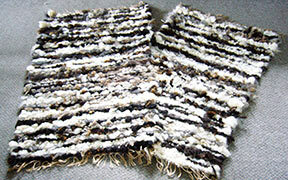 The brown one here on the right is made from rare Manx Loughtan and Balwen fleece, great for historical re-enactment wear. 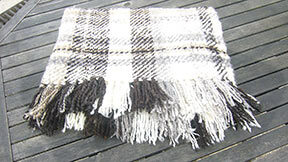 If you would like me to weave you something from your "pet" or special sheep, yes, or dog, if the fibre is suitable then please contact me. 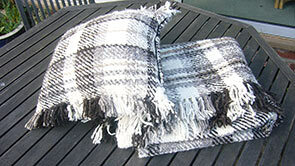 The four pictures directly above show a twill blanket, and matching cushion, made specially for presentation to Johana Lumley in 2012 on behalf of our local Farm Animal Sanctuary regarding all the good works that she continues to do in this respect.The fleece used here was from three of the sheepy residents. 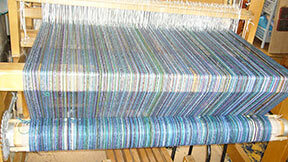 The floor / doggy / hearthrugs below are generally made from upspun fleece locks, these are not done on a peg loom which can sometimes become loose but on my upright Harris loom which really compresses the weft into a very thick and tight rug. 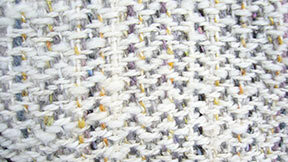 The white one shown at the top left of this page is made entirely of hand woven locks carefully threaded in. 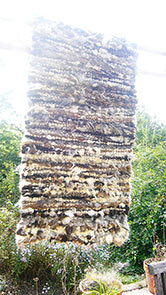 They last many years, the one shown here bottom left with the long locks in the middle was made by myself about 15 years ago and trodden on most days, made from my whole first fleece, it was a huge coloured Lincoln longwool and made on an old homemade bedframe loom. 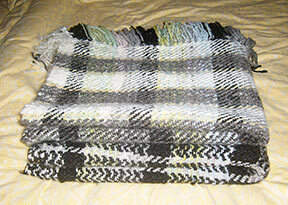 I also make a pets curl up basket, shown on the knitted items page, which cats like. 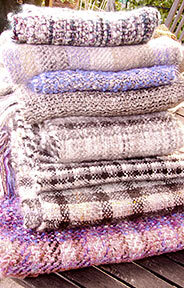 More on page 2 - bags, cushions and scarves.